Seeing legendary downhill skier Lindsey Vonn reminds me how psyched I am for the upcoming 2012 Winter Olympic Games! Wait a minute, there's no winter Olympics this year. 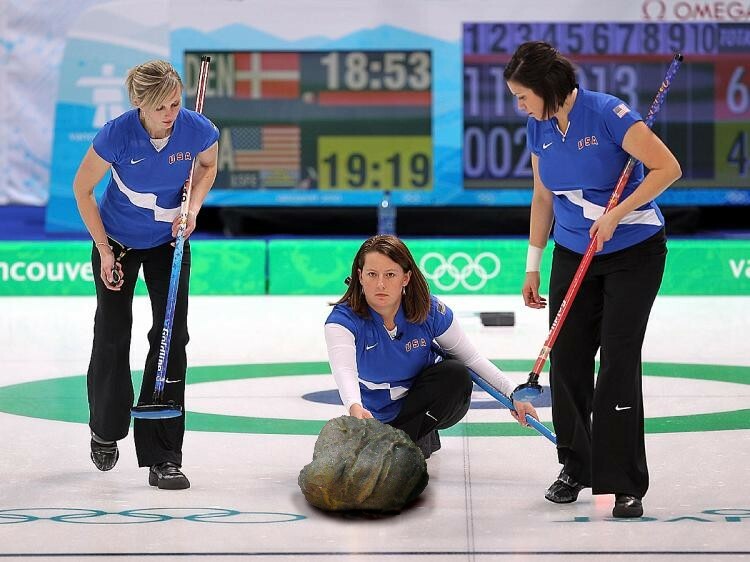 Maybe I still have some 2010 curling matches on the TiVo. (Funny yet not creepy comment) Can't do it. I'd like to ski down Lindsey Vonn's hill, if you know what I mean. I hear she has a thing for guys who use labored euphemisms, so good luck. Labored Euphemisms sounds like a healthy breakfast cereal. Any observations of how much leg Ms. Vonn was showing during her interview with Dave? I mean seriously, what was up with that? I haven't seen that much leg since Jack Hannah was on with that Ostrich. That's why the guests don't get a desk to hide behind. Talk Show Legs has been a television staple for creeps like me for years. So glad to see you're putting those Photoshop lessons to good use. Entirely self taught! And it's PhotoStudio, which I think came with a camera. Without the proper backdrop, the gum just looks like a pile of poo. You even got the gum's shadow. Nicely done!